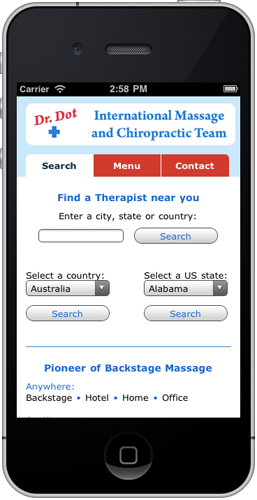 Access our website and book our therapists directly from your cell phone. It works on your iPhone, Blackberry, Android, HP Pre. Hint: If you click on the first "Search" button it will automatically detect your current location and show you our therapists close to you. Android users can get our app from the Android Market. Important: The app requires an active internet connection to work.